It further fit the theme this week to stick with a pencil drawing instead of breaking out the inks  it takes a fair amount of effort to make technical pens seem “muddy” and I’m still trying to keep these quick. The original was drawn with graphite pencil in my 9×10 inch sketchbook; it seemed appropriate to tint it a bit in Photoshop but it’s otherwise unretouched. SALE at ZAZZLE: Monday February 8 – Tuesday February 9 at 6pm EST Zazzle is having a discount of 50% off of express shipping on all orders of $25 and up if you use the discount code ILOVEEXPRESS at checkout. Whether you want something from my Critterwings Shop or anything else Zazzle offers, check it out! Wonderful drawing and nice story. 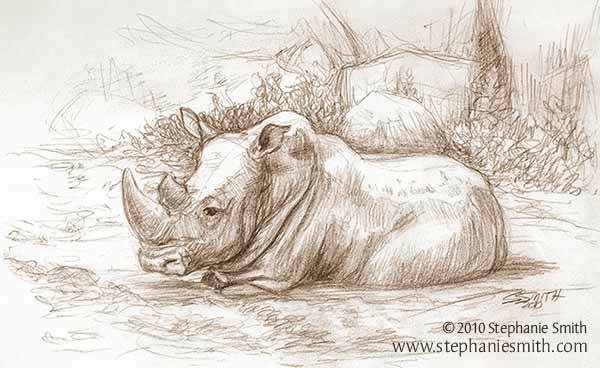 Wonderful drawing, and the zoo is the best reference builder!